I know I haven’t posted on here in a long while, which is mainly due to the Cataclysm launch. Leading up to launch I didn’t have much to do in WoW and just ended up spending most of my time on Counterstrike Source and Battlefield Bad Company. Unfortunately on top of that I still haven’t received my copy from GAME. They mailed me last week to tell me it had been dispatched on the 2nd December, however I’m still waiting. I’m confused to how it isn’t hear yet and I’ve ordered 2 things through the Royal Mail on Monday and Tuesday which both arrived Wednesday and Thursday, yet my game is still in transit. If it isn’t here by tomorrow morning I’ll be taking a trip down the high street to pick myself up a copy at a slightly higher price then return my copy from GAME to my local store… if it ever gets here. In the mean time its just the waiting game. Don’t want to log in without being Cataclysm enabled as there won’t be any more to do than before the patch but look out for some continious updates once I get going again (and possibly move web servers, my current is free and takes too long to load during peak hours which is when I tend to have time to post). I know its been a long time since I’ve updated, thats mainly been down the fault of the website not being my friend. I do most of my blog posts on my lunch break at work, however recently I got IP blocked by my webserver for incorrectly guessing my mail password. With WoW not being a big interest for me since patch 4.0 I was in no rush to get it fixed so just left it for the time being. Now I’m able to get access and have found it to be running smoother after setting up some plugins I’ll be getting back into the jist in the last stretch leading up to the Cataclysm. Guess the first thing to talk about would be patch 4.0.3 which hit the EU yesterday. Its the lead up to patch 4.0.3a which will shatter the world as we know it. Not much was included in 4.0.3, guessing most of it was background stuff in preperation. However there was a couple of class changes, mainly healing buffs for priests and shamans and a litte bit of a nerf for DKs. Nothing effecting me so nothing to worry about. With 4.0.3a in line for release next week and more than likely Deathwings visit to the world he has just shattered I will certainly be logging back on regulary. So far the only reason I’ve logged in was to grab Tipping the rifts on both Wizzam and Tynee, the phases have really interested me but Deathwing sure will. I also still need to get into gear and down the Lich King! Only mere hours til Blizzcon kicks off! With Cataclysm’s date already released what other big news do they have in store for us this Friday? 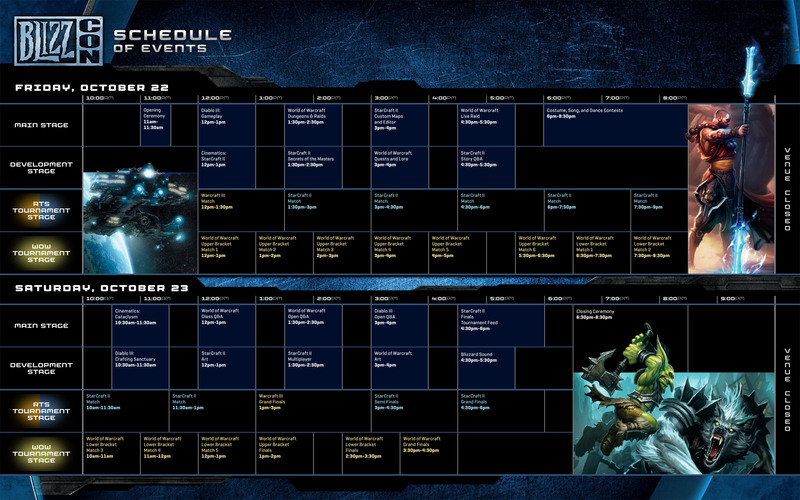 Schedules are already up for the the entire event to give you a slight idea on what there covering, however it doesn’t include exactly what is being covered in those segments 😉 that is probably a secret to everyone outside Blizzard. Rumours are that there will be some big news, which is kind of backed slightly by the fact the Cata date was released early, maybe they didn’t bother holding on because it would of been shadowed? I myself would of loved to attend the event and may possibly make a push to make it their next year. I’m not massively into Blizzard as a whole as I’m only really interested in WoW, however I did really enjoy Diablo 2 and will most likely be getting Diablo 3. Even still, Blizzcon in my eyes is as almost as big as E3 as an convention. Due to the exclusivity and price of entry to E3, Blizzcon is probably the biggest convention I’ll ever get to attend so would love to experience it someday. I’ve been to a couple of conventions before, including GameStars Live and Multiplay’s iSeries. Its the feeling of being there, getting hands-on previews of everything that makes it special. Because of that I won’t be bothering with the Blizzcon Virtual ticket as I’m happy finding out news via the hundreds of gaming sites and podcasts that will be covering it as well, but would love to be there in the future. Over the weekend I eventually took it upon myself to get back into the new patch, I dabbled a bit on the Wednesday night, but didn’t feel like I had enough time to get right into it so I left it aside for a bit. Come Sunday I updated all my addons I could and decided to roll into fire. Back in TBC I was specced fire for end-game but come WotLK I dabbled in some Arcane. Arcane was powerful, and I loved cleaning hordes that tried to get jumps on me while I worked on my dailies however it was a really boring spec for raiding. Now I’ve tried fire again with the new additions of hot streak, living bomb and impact, I can’t get enough of it! I’ve only done heroics so far but can’t wait to jump back into some raiding. Farming heriocs I managed to replace my cape and belt taking my GS up to 5.8k, leaving only a buyable trinket left to save up my JP for. It won’t take long, probably only a night before I’m fully geared. Not sure what I’ll do after that, will probably need to convince my girlfriend to let me do ICC again on Friday. Going to have to make a push to get my Paladin up so I can start leveling my priest before Cataclysm, need to stock up on bags from her tailoring. So congratulations to a big chunk of my guild that managed to get their 310% mounts from Uldaar earlier this week. I’m a little gutted as I only managed to back end of the raid to pick up 3 achievements. I thought there would still be time to get my hands on it to save me some money but that has changed. With 4.0.1 the mounts are all still achievable but the speeds will no longer be 310%, they will be the highest speed you have currently learnt. From this patch onward the only way to obtain 310% is with Master Riding. I may still make a push for the mount, as it is an amazing looking mount, but without the bonus of 310% I’m not so sure I’ll be willing to put in the effort. There are no 310% mounts anymore. 310% speed is now obtained via Master riding, a new flying skill. All flying mounts are now only distinguished by aesthetics. After grabbing my Crusader title yesterday my dailies no longer have much of a drive. I can do them for the seals in order to grab a couple of pets, mounts or tabards but that’s not enough push for me to carry on doing these dailies. The gold was great, I shot from 3k up to 8k while still gemming and enchanting numerous pieces of gear I get from ICC every week but now I don’t have much of a push to do them I feel… bored. The main thing I logged in for every day was my dailies. I’ll still log in for my 2 frosts from a random HC each day, but with no world events and already having the Hallows End achievements its going to be a dry last two month for Wizzam. The only thing I have to do are raids but with most of them being planned or most not having time for when I log in every evening I’m not sure what I’ll get up to.